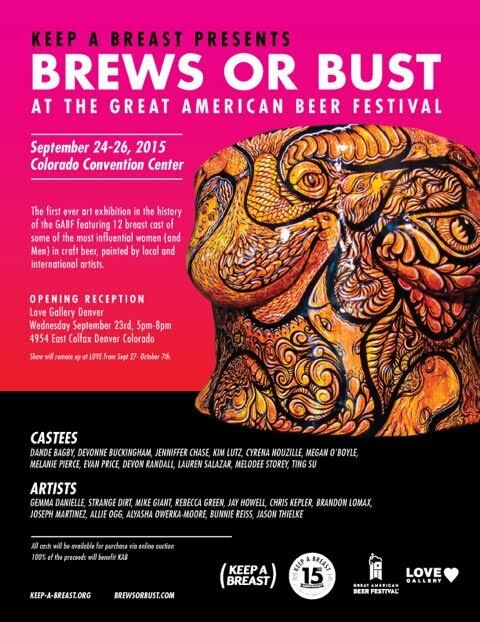 New York City, August 28, 2015 — This fall, the global non-profit organization The Keep A Breast Foundation (KAB) is celebrating their 15th anniversary by teaming up with The Great American Beer Festival for the first ever “Brews or Bust” art exhibition, in Denver, CO, from September 24-26. On display will be 12 breast casts of female brewers from the beer industry (with the exception of one male). 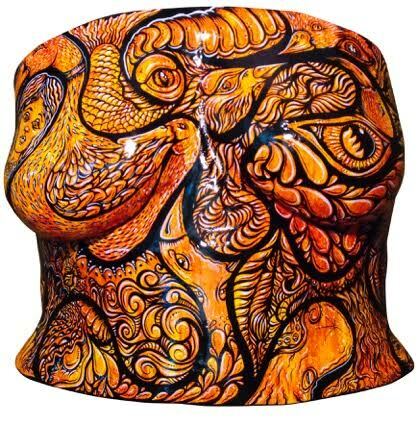 Internationally known artists Mike Giant, Jay Howell, and Alyasha Owerka-Moore, as well as local talents Gemma Danielle, Strange Dirt, Rebecca Green, Chris Kepler, Brandon Lomax, Joseph Martinez, Allie Ogg, Bunnie Reiss, and Jason Thielke, will be painting the breast casts. The theme is happiness, which showcases KAB’s commitment to creating a relationship between themselves, art, breast cancer prevention, and the craft brewing industry. The casts will be available through an online auction on brewsorbust.com from September 24-October 4. The artists’ and castees’ opening reception will take place at the LOVE Gallery in Denver, CO on September 23rd from 5:00PM-8:00PM. Post-GABF, the casts will remain on display at LOVE Gallery through October 7th. 100% of the proceeds will benefit KAB’s ongoing work. ● Jenniffer Chase – Automatic Brewing Co.
● Lauren Salazar – New Belgium Brewing Co. The Great American Beer Festival (GABF) is the largest festival in the country, featuring over 1,300 breweries and 49,000 attendees. The “Brews or Bust” event is the first time in their 33 year history that they have ever had an art component tied to a social cause. “When Melanie from Brewbies and Cyrena from Ladyface Ale Companie asked me about having a Brews or Bust exhibit at the Great American Beer Festival®, I was thrilled. Promoting breast cancer awareness and the importance of early detection in such a fun and artistic way is a fantastic addition to the festival.” said Nancy Johnson, Event Director, Great American Beer Festival. The story of the The Keep A Breast Casts™ is the story of KAB itself. Over a decade ago, KAB’s founders, then involved in their own arts organization, rallied to support a friend with breast cancer. They developed an idea to express the female experience of breast cancer by reimagining the traditional canvas as a participatory sculpture. After some experimentation and partnerships with the right people, they developed and tested a technique for capturing the female bust in a plaster. The result was a white cast that was then customized by artists. The success of these breast casts as conversation starters, awareness builders and fundraising tools ultimately led the creation of the non-profit The Keep A Breast Foundation. “We’re incredibly excited to bring The Keep A Breast Casts to The Great American Beer Festival. This is a fantastic platform to get the word out about breast cancer prevention and a great opportunity to try an amazing selection of beer!” said Shaney jo Darden, CCO & Founder, The Keep A Breast Foundation. For more information on KAB’s Breast Cast Art please visit www.keep-a-breast.org. For more information on The Great American Beer Festival, visit www.greatamericanbeerfestival.com.